Children’s Week is a seven-day call to action, bringing attention to key issues faced by children in America. Starting on June 10, we will kick off a campaign of educating the public, engaging policymakers, connecting advocates to resources, and demonstrating the challenges impacting children in order to drive forth the message that there is much to be done to help kids and families. Use #ChildrensWeek2018 to participate in the campaign. Share your own resources and messaging on the issue areas of the day. 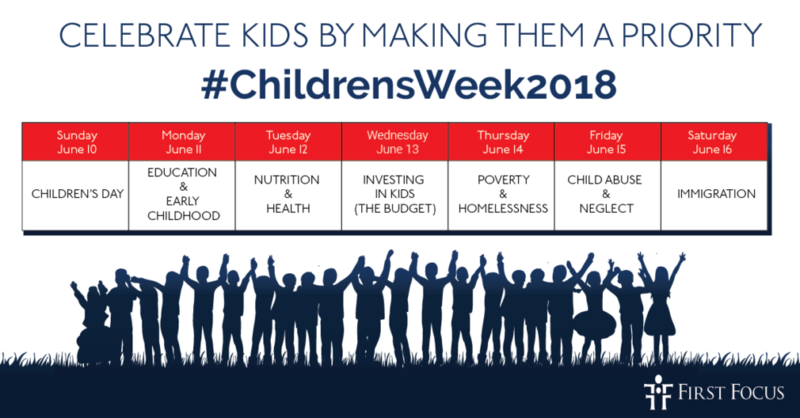 Each day has its own distinct hashtag to use along with #ChildrensWeek2018. The guide for Children’s Week 2018 is here—check it out for resources, key messages, and sample tweets to help promote the week and critical issues we can act upon. Also see our image bank to be updated with new visuals you can use to bring attention to these issues throughout the week.